This special second edition of The Judas Line is now book 1 in the Judas Line Chronicles. Book 2, The Judas Codex, will be released on January 1, 2018. The third and final book, The Judas Revelation, will be released later in 2018. “A great read, filled with action and adventure. The writer was able to balance both the line between light and dark, adding humor to a story that was filled with intensity and evil.” Read more…. “This evil mystery is a heavenly read! 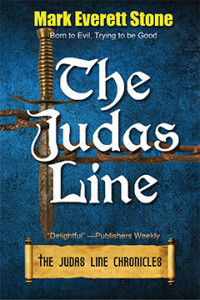 The Judas Line creates a believable mystery which links the ancient past to the present. By building on the ancient story of the betrayal of Jesus Christ by Judas, Market Everett Stone crafts a dark versus light drama which will keep readers hooked. I loved how Stone makes Jude an unwilling member of the darkest family threatening mankind. Simply brilliant!” Read more …. —M.E. Franco, author Where Will You Run? Mark is also the author of the From the Files of the BSI (Bureau of Supernatural Investigation) series. The first book in that series, Things to Do in Denver When You’re Un-dead, won the second place Forward Literature Award for Humor and was a finalist for ForeWord Magazine’s debut fiction award, ForeWord Firsts. The series also includes What Happens in Vegas Dies in Vegas, I Left My Haunt in San Francisco, Chicago, The Windigo City, Omaha Stakes, and The Spirit in St. Louis. The final book in the series, Talladega Nightmares, will be released in 2018. Jude Oliver hails from a long line of assassins. Tired of his family’s treachery and wanting more from life than power, he escapes with their secret weapon, the Silver—an ancient artifact so potent, so evil, that it could plunge mankind into a permanent state of ruin and despair. After fifteen years on the run, Jude receives a surprise visit from a cousin who planned to murder him to obtain the family treasure. So begins Jude’s desperate quest to find another artifact powerful enough to destroy the Silver. His traveling companion is an unlikely friend, Mike Engle—a Catholic priest who found his calling on the brutal sands of Iraq. In the course of their journey, the two men clash with evil in many forms. Mike learns the details of Jude’s incredible history and the family secret that reaches back 2,000 years. Before their final, earth-shattering battle, the duo will find surprising allies and the strength to carry on against seemingly insurmountable odds. Will the lessons Jude has learned about love, friendship and sacrifice be enough to save him from his family and his destiny? Born in Helsinki, Finland, Mark Everett Stone arrived in the U.S. at a young age and promptly dove into the world of the fantastic. Starting at age seven with The Iliad and The Odyssey, he went on to consume every scrap of Norse Mythology he could get his grubby little paws on. At age thirteen he graduated to Tolkien and Heinlein, building up a book collection that soon rivaled the local public library’s. In college Mark majored in Journalism and minored in English. Mark lives in California with his amazingly patient wife, Brandie, and their two sons, Aeden and Gabriel. Click here to find Mark on the web. Mike held up the silvery crucifix that had dispelled the demon, twisting it to and fro in the harsh light of the room. Sighing, he placed the chain around his neck and let the crucifix dangle to rest between his pecs.